Charles Johnson, a 1998 MacArthur Fellow, received the National Book Award for his novel Middle Passage in 1990, and is a 2002 recipient of the Academy Award for Literature from the American Academy of Arts and Letters. He has published three other novels, including Dreamer (1998), Oxherding Tale (1982), and Faith and the Good Thing (1974). 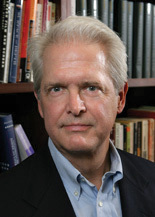 Johnson is currently the S. Wilson and Grace M. Pollock Endowed Professor of English at the University of Washington. He is also the recipient of a Guggenheim Fellowship. Eric J. Sundquist is the UCLA Foundation Professor of Literature and a member of the Department of English. He is the recipient of the Mellon Distinguished Achievement Award, and the author or editor of twelve books including King's Dream (2008), Strangers in the Land: Blacks, Jews, Post-Holocaust America (2005), and To Wake the Nations: Race in the Making of American Literature (1993).